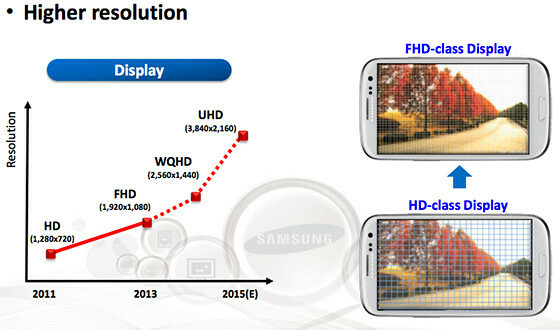 Samsung is planning to start mass producing 5.9-inches Ultra HD Super AMOLED display with 700+ ppi resolution comes next August, report claims. This is right a couple months before the next Note is released in the market making the 4K display a spec for Samsung Galaxy Note 5. It may seem a little earlier for the Korean tech giant to start planning and finalizing parts for its products but Samsung has quite a tough year ahead. With profits getting dips every quarter, Samsung needs nothing but the true innovation and improvement in the next year’s flag bearers – the Samsung Galaxy S6 and the Samsung Galaxy Note 5.
having an Ultra HD AMOLED display for its mobile devices in 2015. Fresh report comes through Phone Arena where folks have received a tip from an unnamed source. If the tip and Samsung’s last year analysis of having UHD screens with 700+ ppi ready for 2015 mobile products are at the mark, Samsung Galaxy Note 5 would be the first to flaunt a truly beautiful screen from its maker. Add in the improved design aesthetics that Korean manufacturer has started to employ and we already have a winner in the phablet category. Note 4 is also being taken with much awe and love by its loyal fan base but the introduction of 5.5-inch iPhone 6 Plus and Android competition is definitely affecting the singular phablet focus on the Note. Better camera retaining the optical image stabilization module, Qualcomm Snapdragon 810 processor, and a beautiful 4K UHD display panel will complete the next edition Note for IFA 2015 in September. Are you looking forward to it?